All modern PC CPUs produce enough heat that they need a heat sink. Almost all of them need a heat sink with a fan. Many heat sinks come with some sort of thermal transfer paste pre-applied - typically a patch of grease; thermal paste; goop or whatever you want to call it. With the heat output of modern CPU's, and even more imortantly, overclocked CPU's, there just has to be something between CPU and heat sink. The reason why there has to be something there is that the two mating surfaces of processor and sink aren't flat. They may look flat...They may have a mirror polish. But, on a microscopic scale, they are vastly different. Without thermal transfer compound, everywhere heat sink metal doesn't mate with CPU package material is a teeny-tiny air gap. Air is a good thermal insulator. As long as your heat sink looks flat when you lay a ruler on it then there'll be a decent amount of actual contact, of course, but the amount of heat that'll actually make it around the air gaps may be surprisingly small. Hence, thermal compound. It's grease with lots of minuscule thermally conductive particles mixed into it, basically. It doesn't conduct heat as well as direct contact, but it's a heck of a lot better than air gaps. Now here is where the picture becomes a little grey, and perhaps a little confusing for the uninitiated. Not all thermal pastes are created equal! Many people tend to purchase a thermal paste that the majority says is better, quite often without considering viable alternatives that exist out there. It's understandable, it is the nature of the consumer. Take Arctic Silver and their AS5 thermal paste for example. Sure it's a proven performer, but there are better performing pastes out there, and quite often cheaper than AS5. ...A hybrid compound of different micro-particles that allows for minimum thermal resistance, excellent ease of use and outstanding long-term stability. Noctua's NT-H1 on paper looks every bit of what we'd expect from the Austrian based cooling company. 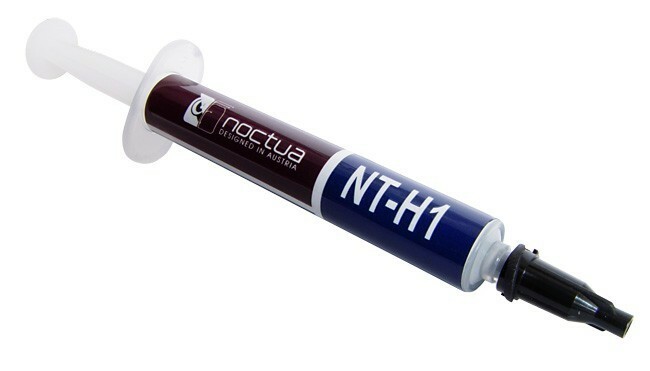 There are some additional features of NT-H1 that you may find interesting, but that I can't include here due to space constraints. The additional details can be found here. A little curious how it holds up to MX-II.